The nine-spotted ladybug is a native species that ranged across the U.S. and Southern Canada, and was the most common ladybug in the northeastern U.S. until the 1980's, when they began to decline precipitously (possibly because introduced species of ladybug beetles excluded the nine-spotted ladybug from habitats that it once favored). 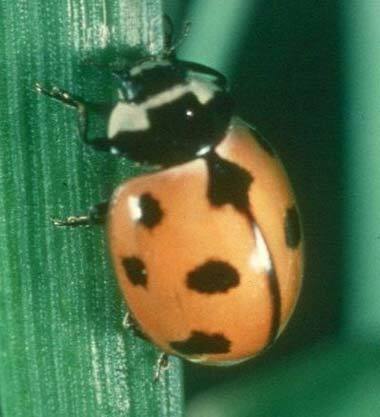 Although the nine-spotted ladybug beetle continues to persist, it has become very rare. Ladybugs help gardeners and farmers by eating tiny insect pests that damage plants. A ladybug can consume up to 60 aphids per day, and will also eat a variety of other harmful insects and larvae (including scales, mealy bugs, leaf hoppers, mites, and other types of soft-bodied insects), as well as pollen and nectar. Ohio, Massachusetts, New Hampshire, Tennessee, and Delaware also designate the ladybug as an official state symbol (see list of state insects for all 50 states). According to John Losey, a Cornell University entomologist who leads the Lost Ladybug Project. (a project funded by a National Science Foundation grant recruiting citizen scientists, particularly children, to search for nine-spotted ladybug and other ladybug species and send photos of them to Cornell for identification and inclusion in a database), there are about 5,000 species of ladybugs, also known as ladybird beetles, with about 450 species in the United States.